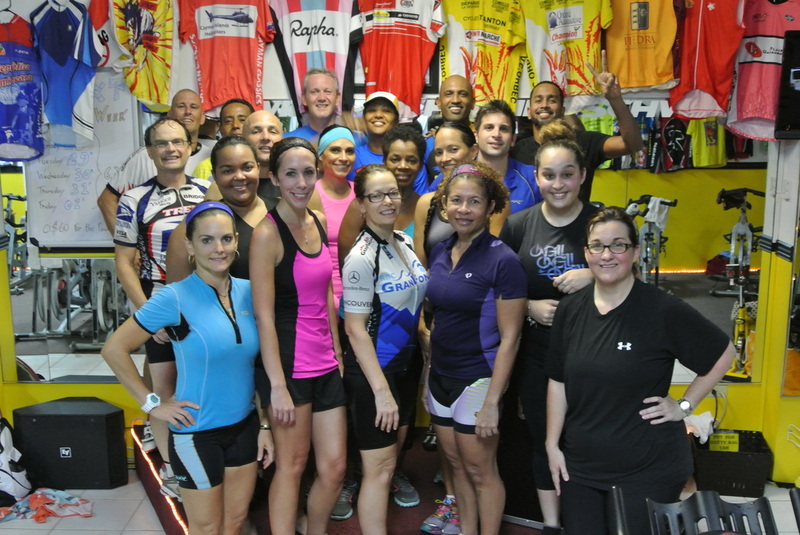 August to September 2014: Sonia Arbo matched the existing record of 52 classes done in 31 days ! For years, the record holders for spinning challenges have been males. The trend has changed, and since July, females have set the last two records. 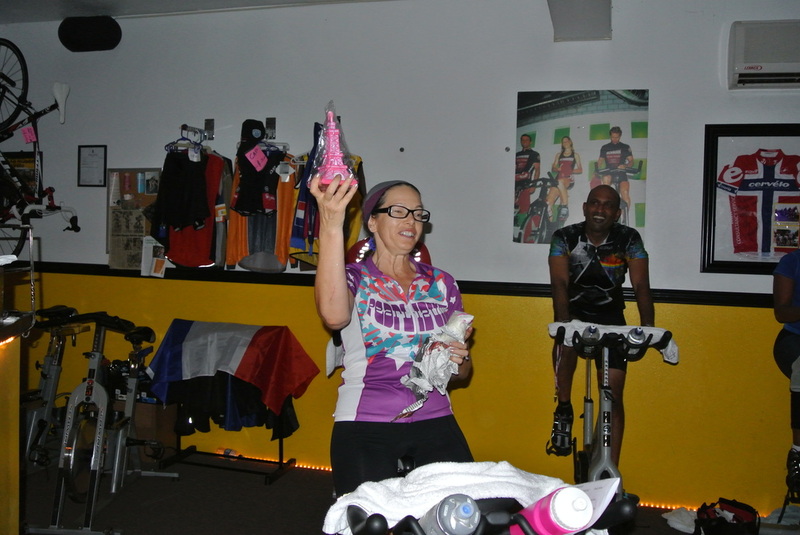 Sonia Arbo, no newcomer to spinning, was faced with the challenge of matching or surpassing the record held by Shawna Morehouse. The story is that the women both rode in the Tour de France spinning series and discussed during the after-ride social time the need for women to be record holders. They thought they would face the challenge together so as to have moral support, but due to personal commitments, the women ended up facing their challenges solo. Whilst Shawna had a few extra rides on the schedule to pick from, Sonia had no such luxury and was faced with the only option of riding every class on the schedule in order to match Shawna’s record - 52 classes in 31 days. Once she put her mind to it, it was as good as done. 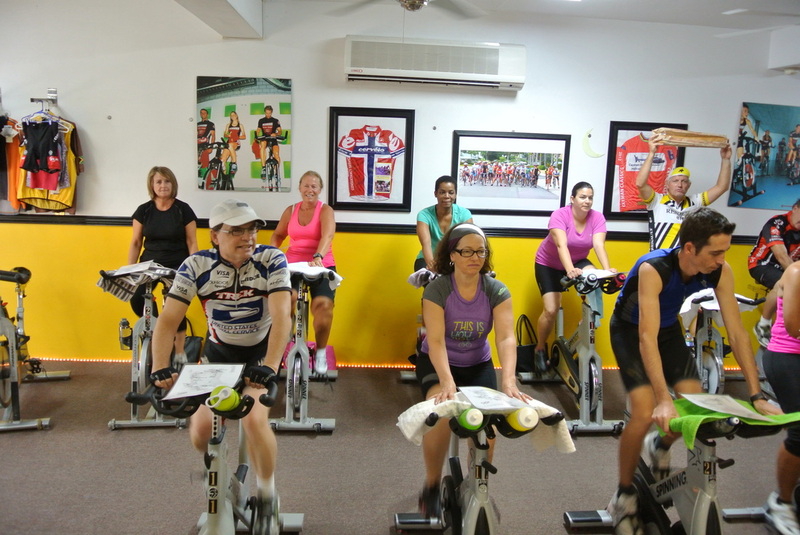 Sonia was at the gym before the instructors and on the bike well before the start of each class. Cathy often remarked how fresh and energetic she always seemed. There was only one day when Sonia looked a little fatigued. It was inspiring to all of us! Whilst Sonia had the simple but profound mantra of “Wake Up!” as her only goal, she actually had the added benefit of a 12-pound weight loss. Will it be a male or female who puts them self on top?? 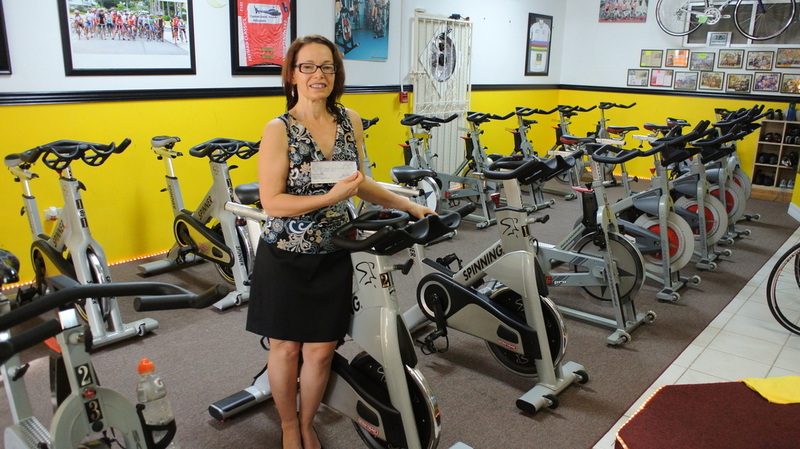 Stay tuned…..
Sept 2014: Shawna Morehouse receiving her donation cheque for the Cayman Islands Crisis Centre. July to August 2014: Shawna Morehouse is the new record holder with 52 classes in 31 days ! 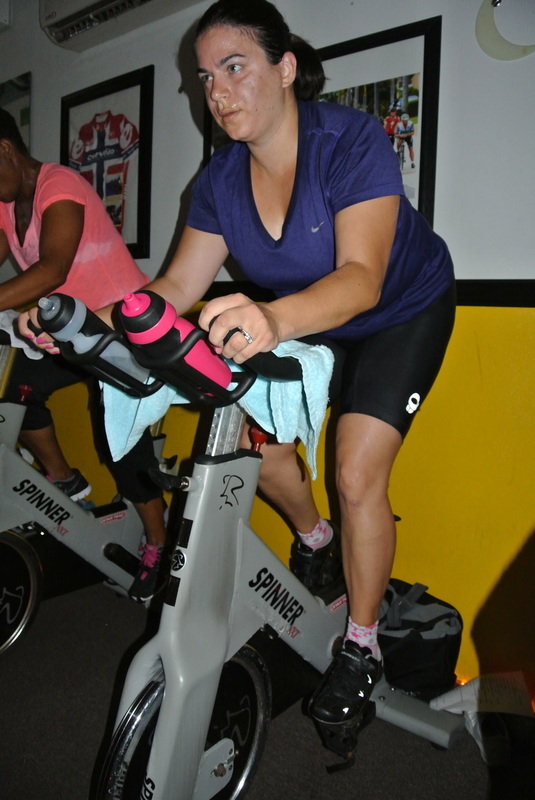 Shawna has been spinning at Revolutions for many years, and recently decided to push the limits. This meant that she wanted to be the first female on the leader board. Once this objective was stated, Brent Cunha (last record holder) initiated a charity incentive by offering CI$100 to the record breaker for the charity of their choice. This then inspired another aspiring record holder, Sonia Arbo, to offer a further $100 (actually her husband offered this as motivation) which then motivated Shawna's employer, Credit Suisse to match that, totalling CI$400 to Shawna's charity of choice if she succeeded. It took great organisation and dedication and many many loads of laundry for Shawna to complete this task and her instructors testify that she rode each class with as equal vigour. 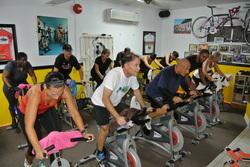 Upon completion of the challenge, she continued to ride vigorously and is currently in Canada doing a Gran Fondo ride. Sonia Arbo is currently two weeks into her personal challenge to match Shawna's 52 classes in 31 days! 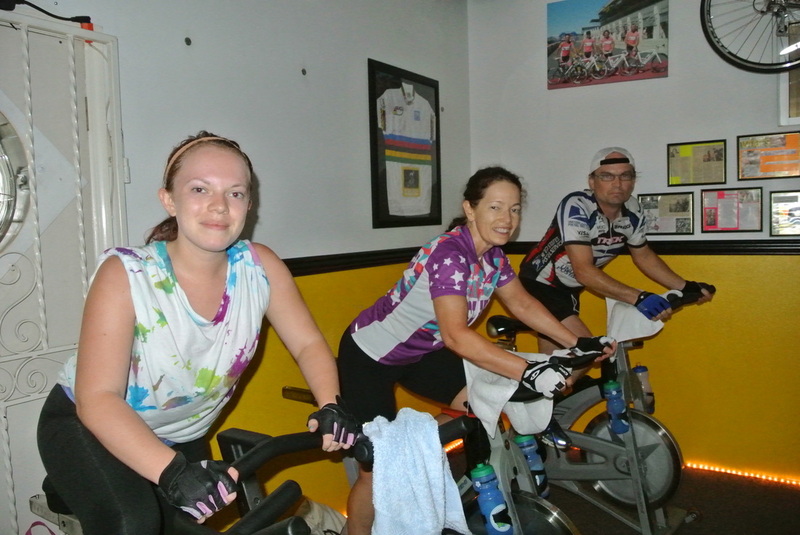 Top left: Shawna with husband and daughter, Spinning is a family affair! He may not be competing as a Track and Field bullet any longer, but his athleticism and competitiveness are still alive and kicking. After beating the long-standing record of classes completed in one month, Brent's record was then beaten by Chad - 43 classes in 31 days. This ignited Brent to embark on another challenge which he took one month to meet -- and surpass! He has set a new record, 45 classes in 31 days!!!! which has not yet been challenged. 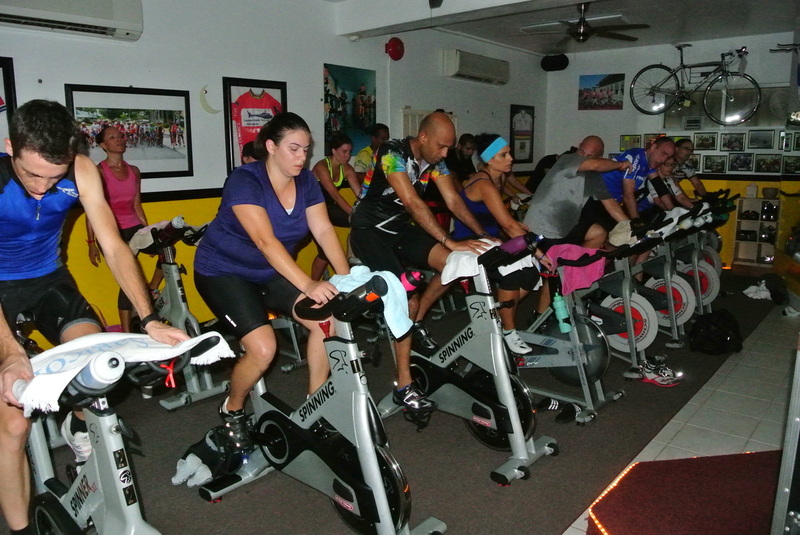 The marl road has it that Brent is in the planning stages of another spinning milestone…..stay tuned for updates. Pictured left is Brent during the recent "Tour de France" build up ride along with his power food- a local style French Baguette. 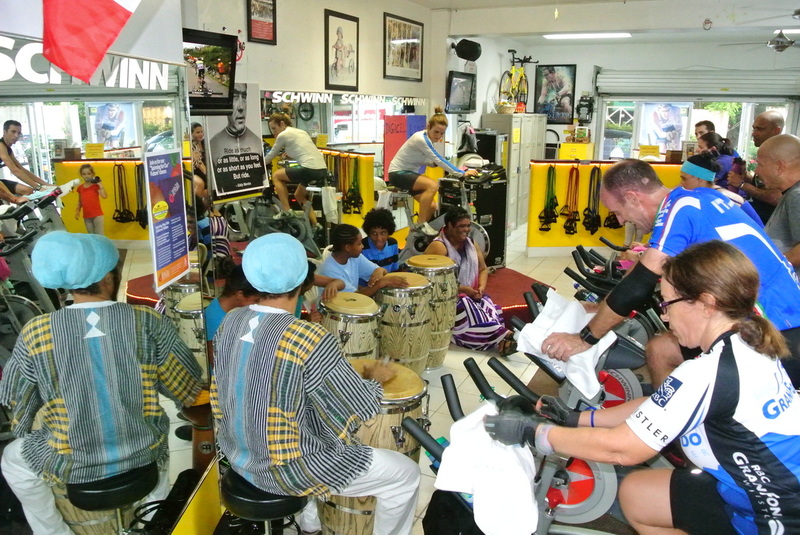 Chad is a very recent new member at Revolutions, however, no newcomer to cycling, swimming and running. He had a road accident some time ago and, like many other cyclists, decided to make his come back with a start at Revolutions. Just a few weeks into his re-training efforts, we saw the "fever" back in his eyes and in his physical fitness. He was coming to the end of one of his initial monthly registrations and purchased a new triathlon bike, pictured below and left. With only a few classes to go, he heard of Brent's accomplishment and Brent (our last record holder) personally encouraged and challenged Chad to beat his record. After some careful studying of the calendar, Chad embarked on the challenge to complete more than 39 classes in 31 days. Chad attended classes on a daily basis, sometimes twice daily, sometimes riding 3 classes in one day! He arrived on time, smiling and rode each class with full vigour and energy…he was inspiring to us. Over the course of the month, Chad often stayed after classes to chat and we came to understand that this challenge was not primarily about fitness- it was a challenge to Chad's personality. He told us that he felt he had gotten into the habit of starting things and not finishing them and this trait really bothered him. He saw, and took, this challenge as an opportunity to turn that around early in the 2014 year. Chad was unwavering in his organisation, his commitment and his passion. He successfully met the challenge and accomplished a whopping 43 classes in 31 days. 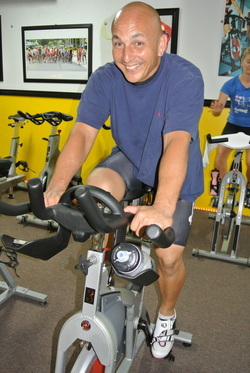 Chad told us that he took a few days rest and then started his triathlon training with a mini triathlon- he felt great. He is back in the saddle, both on the road and in the spinning studio…… who knows if this record will not insight Brent or someone else to yet another challenge? We extend our sincerest Congratulations to Chad for this amazing show of commitment and dedication! We wish him new goals with his new found personality strength. 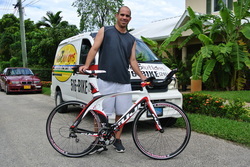 Chad early 2104 with his new triathlon Fuji D-6 bike purchased at Revolutions with Jerome's help. Over the years, Revolutions has extended various challenges to its students and to the general public alike. These have included 2 hour rides, student designed rides, 25 classes in 30 days and most recently during November and December a challenge to complete 30 (or more) classes in 6 weeks. 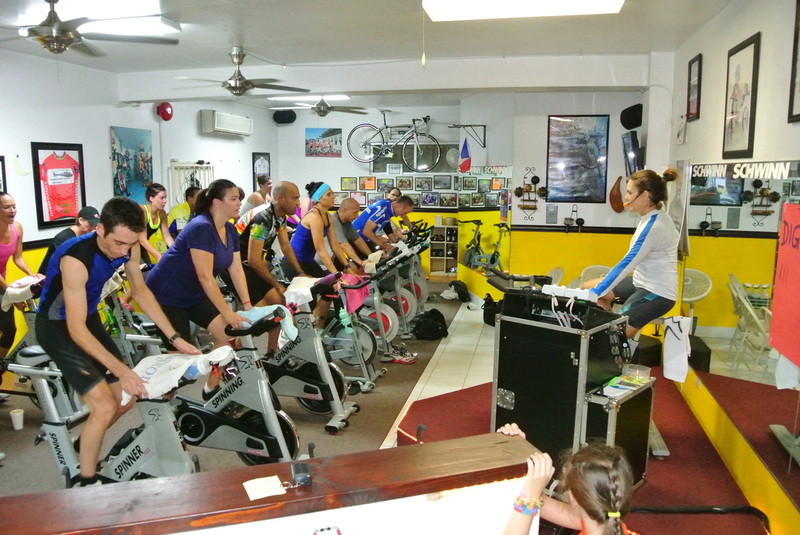 Despite the emphasis on 'personal competition' versus cross competition, the atmosphere at Revolutions lent itself to the students competing (while encouraging each other) to break previously held records for number of classes ridden in a 30 day period. That record was 37 classes and it was achieved in 2009. Since that time, no student has ever attempted to break that record. 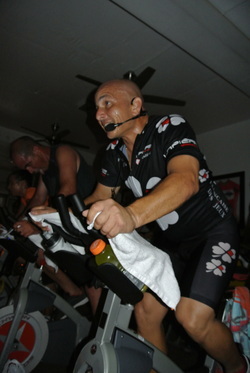 Brent Cunha, pictured above and below here, started spinning late last year and during the November/December challenge, decided to go for a new record. He succeeded, and totalled an amazing 39 classes in 31 days!!!!!!!! He maintains that the challenge was enjoyable, but not easy, and states that it primarily has made him much stronger in his road cycling endeavours. 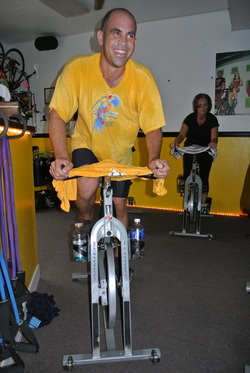 Brent followed the November/December challenge and committed in January to unlimited spinning. He typically attends between 9 and 10 classes weekly, always with a smile, always with devotion and enthusiasm and always with a positive word to at least one student in the class. Before he announced his next personal challenge, his way of encouraging another young man and cyclist was to offer $100 to anyone being the first person to beat his record of 39 classes in 31 days. We know that it is not going to be easy, so we decided to match the sum. We have several people spinning an intense weekly schedule right now trying to beat the challenge as well as others trying to achieve their own personal challenges … We will keep you updated on these student stories and on Brent's next personal challenge. Look out for updates on our next Challenge, Tour De France 2014! This is a 6 month training opportunity and commitment culminating in a 3 hour ride on July 25th.